This user-friendly bottle of DaVinci Gourmet sugar free cinnamon flavoring syrup allows your busy baristas to quickly and easily serve up delicious hot, cold, or blended drinks with irresistible flavor without the sugar content! DaVinci Gourmet flavoring syrups complement your beverages without overpowering them or being too sweet. They are specially formulated to resist curdling in milk and hold up well under heat, making them the perfect choice for espresso-based drinks, brewed coffee or tea, and more. I can’t say enough about this cinnamon flavor. My customers love it and they can’t get enough. It has a versatile flavor that pairs well with a few others and allows for some creativity! What's better than a Cinnamon Dolce coffee house drink? 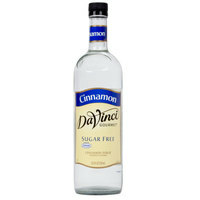 How about a home-made drink using DaVinci Gourmet Sugar Free Cinnamon Flavoring syrup! Skip the calories (and the cost) and enjoy the great flavor from the comfort of home! If you are looking for a cinnamon that tastes like fireball candies, then get this one. If you're looking fora more subtle cinnamon flavor, go with a cinnamon brown sugar or another flavor. Definitely doesn't taste like cinnamon dolce, which is what I was hoping for. I love anything that is cinnamon sugar flavored so when I saw this, I knew I had to try it. I was not disappointed. It has a great flavor with no guilt. Another warm and spicy flavor that is perfect for the fall season. The sugar free option is superb and the taste is really wonderful. Makes a great cinnamon spice latte. It tastes like cinnamon flavor. It is a good product for those who have to watch their sugar intake. Something other than splenda would have been a better sweetener. This one was more liked for hot coffee. Trying to engage students while creating a fun atmosphere can be challenging. We use these Sugar free coffee syrups at our high school coffee bar to create unique, and fun beverages for the students. Great flavor without the calories and the sugar. No unfavorable aftertaste. Cinnamon sugar free is amazing. My daughter loves to suprise me with an expresso and she puts cinnamon and apple in it..it tastes absolutely amazing! I found very sweet ... but customers have not complained and I still selling. I think it's a flavor that you provide in your coffee shop because it is known . I love the dolce syrups. I couldn't find sugar free versions of coffee syrup very easily until I found the webstaurant store. great flavours and great price! The Sugar-free syrups I purchased are a great way to cut calories and still enjoy a good cup of coffee. Flavors are excellent! This is the best non-calorie coffee flavoring my family ever had. I do not own a Restaurant but do a lot of entertaining so my guest comes to the house expecting a taste of my famous international coffee and a choice of flavor from Dolce & DaVinci. We have used DaVinci syrups at our drive-thru espresso stand and have loved them as do our customers. Since finding WEBstaurant I will be purchasing alot of my syrups from you due to the great prices. Thanks! I like these syrups offered by Webstaurant Store because of their intense flavor and long-lasting size. Great for coffee drinks and even milk shakes! We mix coffee and caramel for a truly delicious blend of flavors! I'm always worried if a sugar free syrup will taste as good as a reg. syrup and these are wonderful. I can't tell the diffence. I will be purchasing more. I love all the DaVinci syrups. They are FAR superior to other brands. The flavors are much deeper, more complex and less artificial tasting. Some are better than others though... the English Toffee is my favorite and I like that as a base for everything else. I love the Dolce D'Leche and the Kalhua. The Carmel is good as is the vanilla and Coconut. The banana is ok, though it's got that really fake banana taste. My kids love that taste though, so go figure. Same with the peanut butter and the chocolate... they are good, but taste nothing like the real thing. Creme d'Menthe is an interesting twist with the Chocolate. I recently purchased 15 bottles of sugar free syrups I use them in cookie batter, pancakes, yogurt, bread dough, whipping cream. Great prices and shipping! The syrups are great! I and my friends are on a carb restricted diet and these flavors truly enhance the taste of many of our meal replacements. Your prices are a bit higher than my other source, but they won't ship in cold weather for fear of freezing and breakage. I adore these sugar free syrups. I use the caramel and hazelnut in my coffee/espresso every morning to make a super special wake me up drink! I use the blueberry syrup in blueberry martinis and mixed in with real frozen blueberries and heavy cream to make a wonderful low carb ice creamy dessert. Great product, and quick shipping I would recommend this site to anyone that is looking for an alternative to Amazon. Also the flavorings work great with protein shakes. I love Webstaurant's variety of sugar free coffee syrups. Helps me forget my dietary restrictions. Good flavors, no aftertaste in the flavors I have tried so far. I haven't tried any of the Dolce products but my customers seem to like this. So it is no different then purchasing DaVinci or Torani. WE LOVE THESE! We use them to flavor muffins, and also all our tropical drink flavored cupcakes! So excited to see WEBstaurantStore.com carries the Dolce, DaVinci brand - we'll definitely be ordering them through here in July! I use this for my Whip-it whipped cream dispenser. With a pump I can add the same amount each time and I don't have to add flavor and sugar separately. It has a very nice taste. Excellent product at a great price! The bulk of our orders from Webstaurant store are these syrups. We carry over 30 regular flavors and at least 10 sugar free, and our customers love them. It gives us a real advantage over our competitors for minimal capital. This is a delicious product. I use it in my coffee. It is like having a dessert in my coffee. You should give this a try!! We use these syrups for cappucinos and mocha flavorings and the price is right and the taste is great. Will be trying more flavors in the future. I have tried almost every maker of sugar free coffee flavorings and this Dolce is one of, if not the, best! I highly recommend Hazelnut especially! I'm getting Lime this time too so I can make sugarfree Margaritas! These are the same brands I have been paying the same price for less than half the oz. I use them in tea instead of coffee, and they are wonderful. The only problem is there are so many flavors to choose from !!! Thanks for a great product at such a reasonable price. This is my favorite flavored syrup. Worked @ high quality coffee shop in the '90s & this is all we used. The sugar free syrups are the best & impossible to find anywhere. So happy u have it! Great to make your own coffee drinks at home! Tastes as good as Starbucks, but it's lot less expensive. And there are more sugar free flavor choices than Starbucks. Great pricing for a great product. However, the bottle mouth size has increased and the pourers no longer fit. We now have to keep reusing the old bottles in order to use them with the pourers. I used these for an espresso bar at my sister's wedding post-reception, and have catered a few events since! Starbucks sells these for more per bottle, so this great price makes it even sweeter! These syrups make great-tasting drinks that are super easy to make! These syrups are great. They are strong enough that a couple of pumps is all that is needed. One bottle lasts a while and adds nice flavor to coffee. Highly recommended. Purchased a variety of syrups to add to my childrens Christmas gift baskets. All have been thrilled with their flavors - especially the cocoa drinker who got"Peppermint Patty". This suger free syrup has great flavering with no after taste. It works well in protein shake mix to create new flavors for sampling shakes. Great tasting flavor syrups. We have purchased several varieties and use them for Italian Sodas. These bottles go a long, LONG, way. Quality has met our expectations. We've bought several of these syrups, the sugar free versions. The cherry and strawberry are the reigning favorites of those we've ordered for best approximation to expected taste, but we haven't yet tried them all. Not only is this a great product. The Webstaurant Store makes purchasing this item very easy. Why would I purchase my items any where else. These syrups are absolutly fabulous. There are so many selections available to choose from in Sugar Free. The arrived in excellent time and very well packaged. I will contine ordering them from this company. These syrups are great, I was ordering form another supplier and found these, they are an awesome deal for the price, good quality and fast on shipping too. Excellent Value and price. We use these in our healthy Smoothie Meal replacements to give touch of flavor. Sugar Free are our favorites and they are mostly sweetned with Splenda not aspartame. Fast Shipping and prompt. Wonderful in my coffee during the week, much better price than that found at Sams club. Has very good flavor, comparable to Starbucks or caribou and a fraction of the price. Good, high quality syrup. The bottles are plastic and will not break in transport. Webstaurant also offers the matching white syrup pumps for this brand. Don't use a lot of coffee syrups, but wanted to give this one a try. We really have enjoyed using it. Good quality, great taste, great price! Flavored syrups make a great addition to coffees, but why stop there? Add to sparkling water for a delicious Italian-style soda... vanilla makes a great "cream-soda" treat. The shipping was fast, fragile items safe wrapping, cheapest deal, great quality product, I just keep coming back for more. And I never had any problem. we started featuring a flavored coffee of the week. I used a few of the top shelf stuff, then i found this line. And lets just say we are hooked. good flavor and variety. the ONLY knock for us on this is the bottle. it is smaller than the glass ones and fit a little looser in the rack. other than that, we have been very happy with the trio! These syrups are great for any coffee lover! Can also convince non coffee lovers to enjoy coffee. Great selection of flavors! Excellent value and price! !